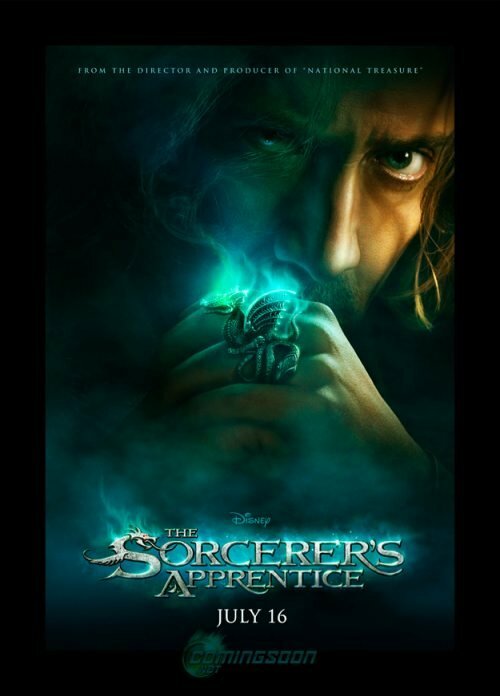 Among all the big-budget, special-effects-heavy wannabe blockbusters coming out this summer, the one I'm looking forward to most may very well be The Sorcerer's Apprentice. Yes, maybe even more than Iron Man 2. I can't explain why, but something about the new trailer makes it look like exactly the kind of fun you're looking for midsummer, with a new crazy Nicolas Cage performance to boot. Clearly I'm not the only one excited to see Cage above all else. Coming Soon has debuted the film's new teaser poster, which features Cage and some kind of mysterious, smoking ring, which I'm sure will be crucial to the plot somehow. It's appropriately intriguing and vague for a teaser poster, though it doesn't really capture the sense of fun that I'm looking forward to. I guess that comes next? Check it out below.